Russet Street Reno: Walkway is finished! I can't believe we got it done ahead of schedule - one day shy of 3 weeks from start to finish. It seemed impossible to get the puzzle finished with the stone that we had available, but we got it done. We do have a couple of stones in the middle that are a bit higher, but the shape of them was great, so we decided to work with them. 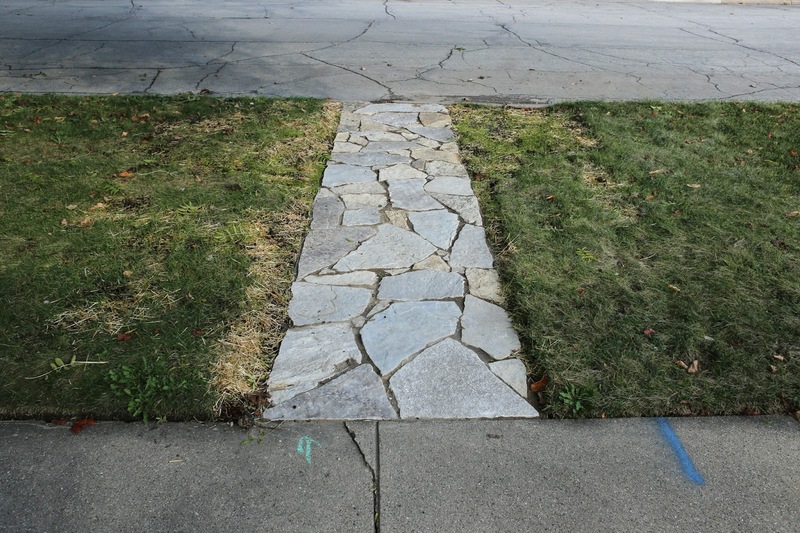 One important thing was making the stones perfectly level with the sidewalk, and the curb. We did a great job with that! Once we got halfway through, I stopped using the previous stones as my 'level' guideline, and instead moved the the curb and worked backwards. This ensured that I was level with the curb, and I could adjust the middle of the walkway to match up with both sides. I was very happy that we got to use this enormous stone I bought, it had a big flat edge to use against the (wrecked) curb. I was worried they would wait til we had this all done, then rip out the curb for repair...but it appears they don't give a crap! It would sure look a lot better if the curb was fixed, but at least my stones match up with the gap. Once we got everything set, we placed (and leveled) a bunch of small stones into the bigger gaps, and swept in the polymeric sand. A quick pass with the hose, and we happily called it 'done for now.' If you haven't used polymeric sand before, it is wonderful! It dries so hard, you have to chip it out....great for applications like this. A big bucket from Home Depot was $20. I got some grass seed down asap, and I'm happy to say that it's already growing! I was worried it was a little too late in the season to plant it (put it down Sept 29), but luckily the weather has been cooperative. For about $200 and some physical labor, we got a walkway that fits with our house much better than new concrete. I am happy! My only tip for you is to avoid buying anything from Home Depot unless you absolutely have to. We don't have a truck, so it's not easy for us to run to the stone yard for more sand, gravel, etc. You will spend WAY more money buying that stuff bagged from Home Depot, always buy in bulk and buy MORE than you think you will need. Sand and gravel is cheap, give any extra away or find another use for it. Many garden centers carry sand and gravel, too...so find a place to buy in bulk! Wow! This looks awesome! You did a great job! Way to make lemonade from lemons on that one. This looks fantastic - and way better than typical concrete would look. You always amaze me with your renos! Ok, SO worth it!!! I know it was backbreaking but pat yourselves on your (sore) backs b/c it looks phenomenal. And bonus that Ash got to play w/ foot long stakes during the process! I need to remember this. Best babysitting tool ever.